Men and woman, it’s February which also means Valentine’s Day. 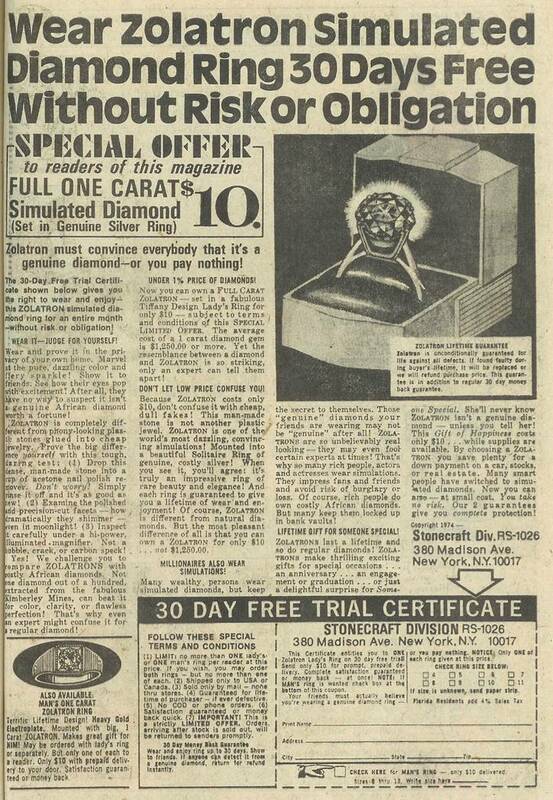 So why not clip the coupon from this ad (taken from World’s Finest Comics #228) and get your loved one something that truly tells them how you feel! Yes, a genuine Zolatron ring is exactly the kind of gift they crave this year. With genuine silver ring band and genuine simulated diamond, this ring is guaranteed for life (or 30 days, or until the company goes belly up, whatever comes first). How many guys out there would give their gal a $10 engagement ring? I like how the ad states that “She’ll never know Zolatron isn’t a genuine diamond – unless you tell her!” You’re kidding right?